As an editor I want to see constraints violations on Form and Sense statements in order to see mistakes in the data and fix them. Right now statements on the Form and Sense level are not checked for constraints violations. 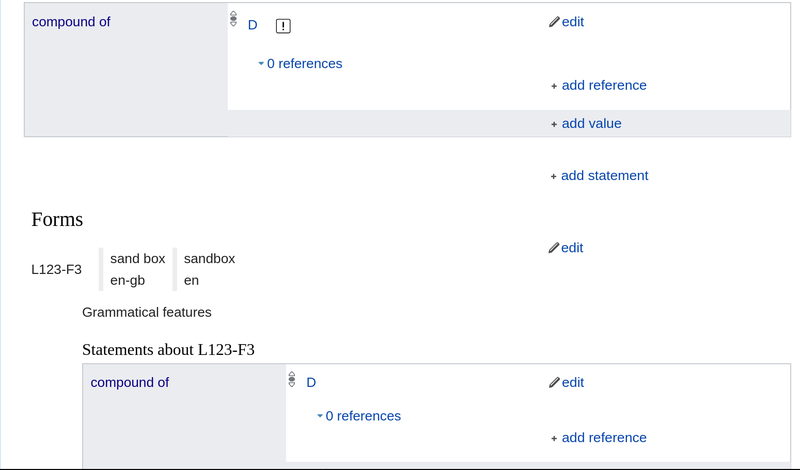 https://www.wikidata.org/wiki/Lexeme:L123 has two "compound of" statements at the moment. The one on the Lexeme level shows a constraint violation because of a missing mandatory qualifier. The one on the Form level doesn't. CommunityTechBot raised the priority of this task from High to Needs Triage. CommunityTechBot renamed this task from n3baaaaaaa to Check constraints on forms and senses when loading lexeme entity page. Pablo-WMDE moved this task from Doing to To Do on the Wikidata-Editor-Experience-Improvements-Iteration7 board. Pablo-WMDE moved this task from To Do to Doing on the Wikidata-Editor-Experience-Improvements-Iteration7 board. https://github.com/wikimedia/mediawiki-extensions-WikibaseQualityConstraints/blob/master/modules/gadget.js#L385 seems to be where it's at. WMDE-leszek moved this task from To Do to Doing on the Wikidata-Editor-Experience-Improvements-Iteration8 board. Lydia_Pintscher moved this task from Test (Product Review) to Done on the Wikidata-Editor-Experience-Improvements-Iteration8 board.